Macbook Case with Keyboard Cover & Screen Protector - ON SALE! Exquisite finish plastic hard shell case protects your MacBook from scrapes and scratches. Ultra slim lightweight hard case has 9oz in weight and 1.2mm in thickness design almost adds no weight to your device. The four rubber feet also create a thin layer of air between your MacBook and the desk & keeps your MacBook firmly in place. Exquisite finish plastic hardshell case protects your Device from scrapes and scratches. Ultra slim lightweight hard case almost adds no weight to your device. The case allows access to all plugs and drives, plug your charger, cable or headset without removing the case. The case is designed with two rows of bottom ventilation, allowing safe heat disbursement, help your MacBook staying cool. The four rubber feet also create a thin layer of air between your MacBook and the desk. Four anti-slip silicone feet keep your device firmly in place. 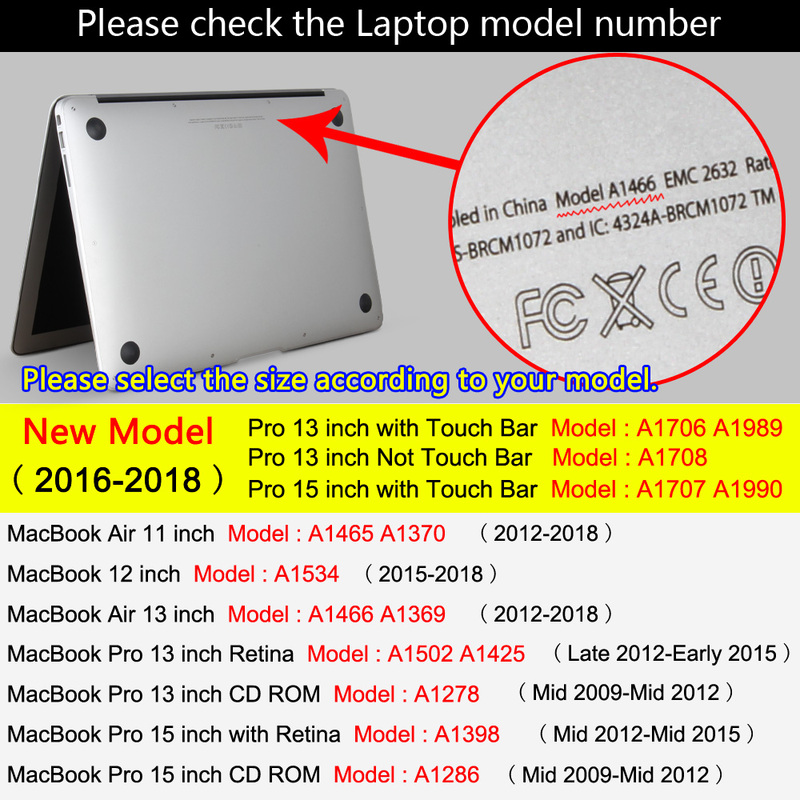 Note: If you’re not sure about the size and model, please check the back of your Laptop, you could see the model (Axxxx) printed there, and then you can choose the correct cover for your Laptop with the following comparison table, or contact us, we’d like to help.